What are the common mistypes for struggle? What is the definition of struggle? 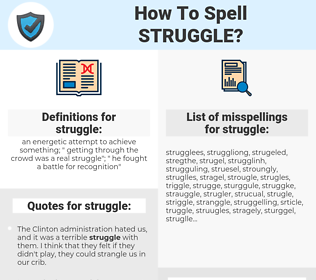 What are the quotes for struggle? What are the rhymes for struggle? What are the translations for struggle? 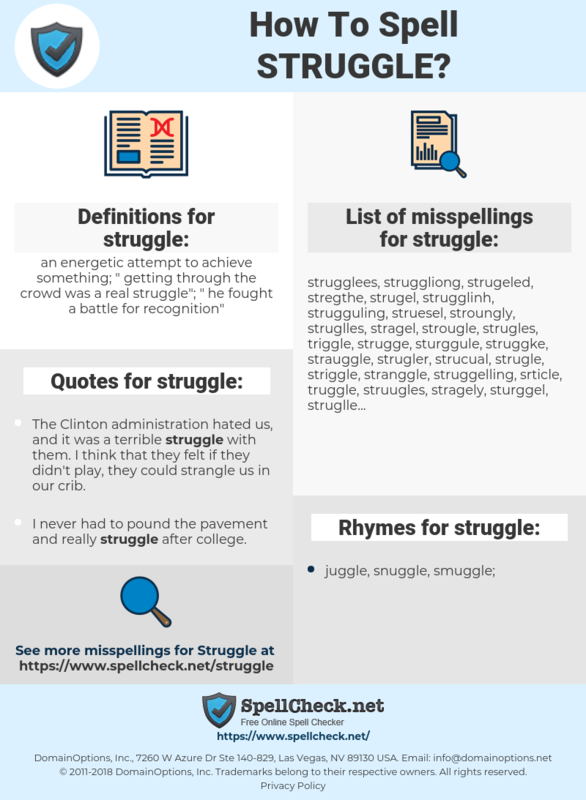 What are the common typos for struggle? This graph shows how "struggle" have occurred between 1800 and 2008 in a corpus of English books. strijd, kamp, zwoegen, slag, inspanning, gevecht, vechten, vechtpartij, worstelen, worsteling, krachtmeting. lutte, combat, conflit, lutter, se débattre, avoir des difficultés, bagarre. Widerstand, Anstrengung, streben, Kampf, Ringen, kämpfen, Auseinandersetzung, Gerangel, sich durchkämpfen, ankämpfen, sich abrackern, sich wehren, sich abquälen, strampeln, krebsen, Bataille. あがく, もみあい, 踠き, もがき, 揉み合い, 足掻く, 藻掻く, 踠く, 喘ぐ, 争闘, とりあい, 取り合い, ストラッグル, もがく, 取合い, 苦闘. empenho, luta, conflito, dificuldade, lutar, ter dificuldades, briga, lutas, batalha, confronto, peleja, contenda, batalhar, debater-se, oferecer resistência, passar por dificuldades. batalla, combate, lucha, de lucha, luchar, esforzarse, forcejear, tener problemas, esfuerzo, disputa, pelea, conflicto, resistir, contienda, pugna, forcejeo, refriega, debatirse, moverse con dificultad, penar, embate.